The study of water, movement and its behaviour. 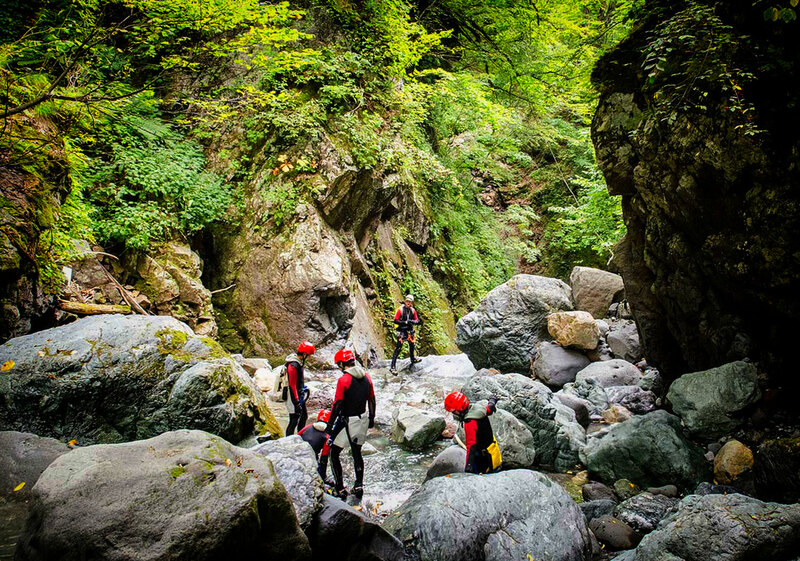 Canyoning Hydrology: The study of water movement and its behaviour relating to the topography, which allows us to properly assess dangerous water hazards that can exist in canyoning. The most common terms you will hear are swift water, whitewater or class 3 canyons. These types of canyons are located all around the world and are considerably different from dry canyons which require a separate skill set to navigate the hazards. When grading swift water canyons the French FFME System is better adapted than the ACA System. To understand these gradings, consult the Grading section. 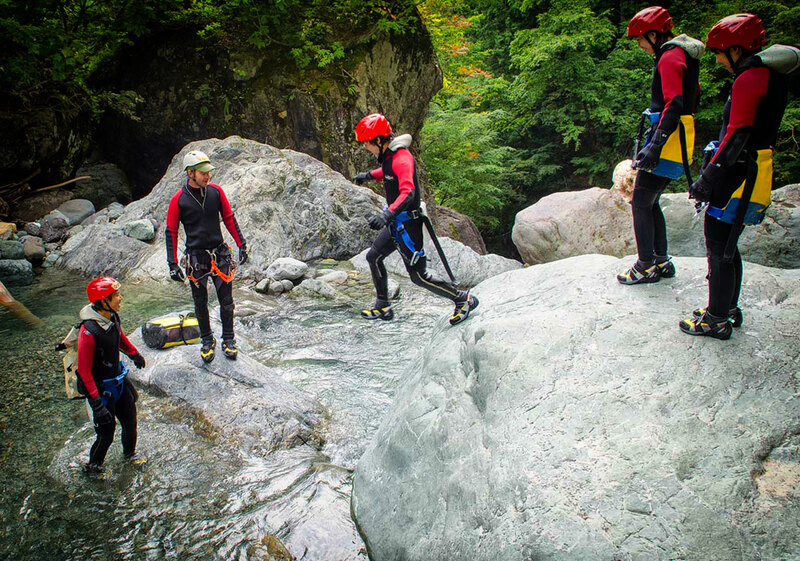 Swift water canyons can be extremely dangerous and as with all aspects of canyoning, instruction, practice and training cannot be substituted for this information. Water behaves differently according to the volume, shape of the river bottom and types of obstructions which can then effect and produce different movements. 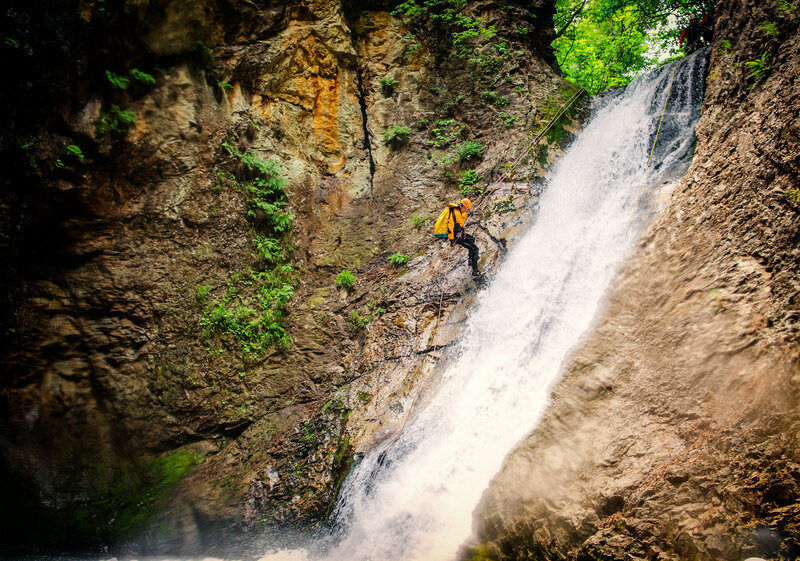 Canyoning Hydrology needs to be learnt to reduce the risk of injury, mishap or even death. Swift moving water exerts a force on any object it encounters, whether it is a rock, bridge or person in the water. This force is dependent upon the speed of the water. As the speed of the current increases, so does the power. Moving water will always exert a continuous force on an object or person. It never stops, unlike an ocean wave which has a cycle of breaking and receding. Water may sometimes look as if it is moving randomly, but to the trained person it is moving in an orderly and predictable way. 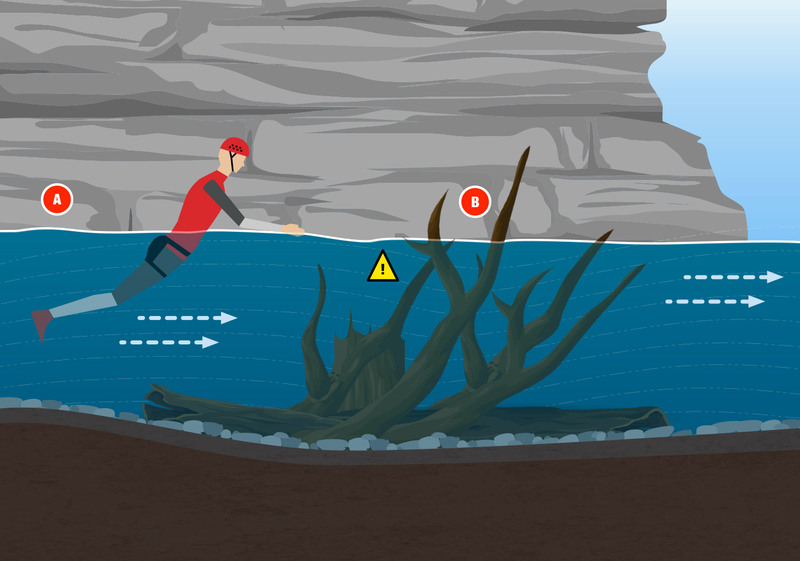 Surface features can be “read” and used to predict what is happening under the water. The nature of rivers in a canyon are variable and are determined by five main factors. 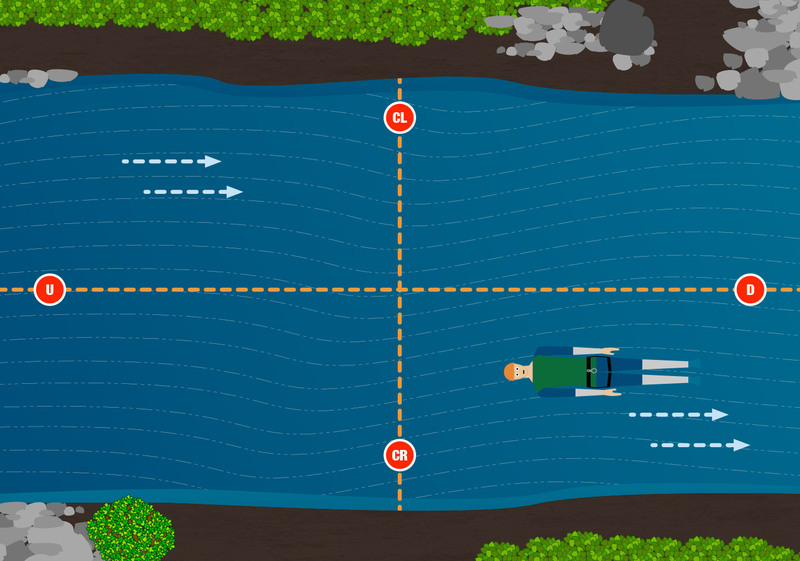 Understanding how moving water behaves, you can use the canyon river to ascertain a level of risk management and avoid unnecessary or unacceptable levels of danger. Topography is generally consistent over time. Increased flow, as during a flood or high rainfall season can make permanent changes to the streambed by displacing rocks and boulders, by deposition of dirt, sand or stones or by creating new channels for flowing water. The gradient of a river is the rate at which it loses elevation along its course. This loss determines the river’s slope, and to a large extent its rate of flow. Shallow gradients produce gentle, slow rivers while steep gradients are associated with more forceful flows. Constrictions can form a water hazard where the river’s flow is forced into a narrower channel. This pressure causes the water to flow more rapidly and to react differently to the river bed. 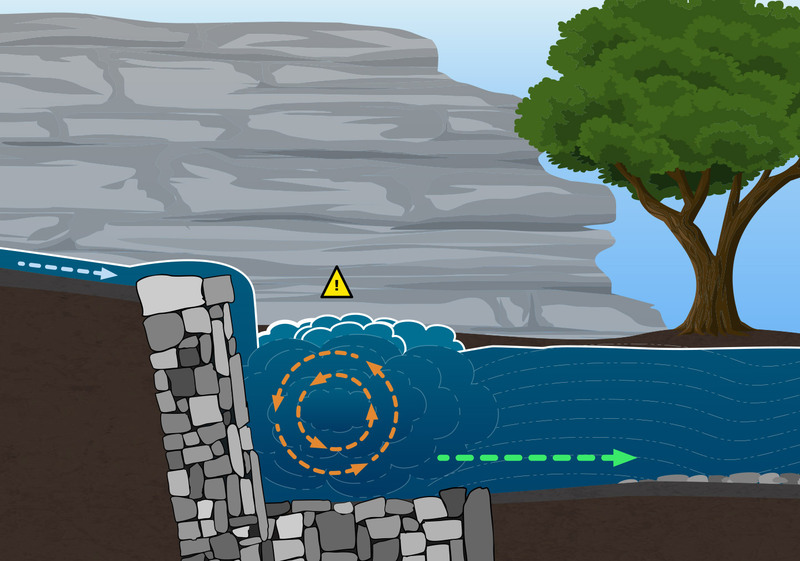 A boulder or ledge in the middle of a river or near the side can obstruct the flow of the river, and can also create a “pillow”, when water flows backwards upstream of the obstruction, or a “pour over” (over the boulder), and “hydraulics” or “holes” where the river flows back on itself—perhaps back under the drop,often with fearful results for those caught in its grasp. Measuring water flow is an important aspect for canyoners. A marked increase or decrease in flow can create a hazard or make safe passage through previously navigated rapids more difficult or impossible. Flow rate is measured in either Cubic Meters per Second (m³/s) or Cubic Feet per Second (cfs) depending on the country. By knowing the measurements of the river at a given spot, it is possible to calculate its flow volume at any point between confluences. Note: Always keep a lookout on the water flow before, during and after the canyon. Being able to judge the speed and volume maybe able to help make a informed decision on escaping incase the flow increases. Terminology is used across the board in canyon hydrology as well as other white water sports. Below is a listed a brief explanation of each term that is used when describing white water. Boil Boils are formed when a large flow of water runs into a large obstruction, causing water to “pile up” or “boil” against the face of the obstruction. Pillows normally signal that a rock is not undercut. Boil Line This is a line of boiling water that delineates the water going down stream from the water that is flowing back toward a hydraulic. The further away a boil line is from the hydraulic, the more hazardous the feature. 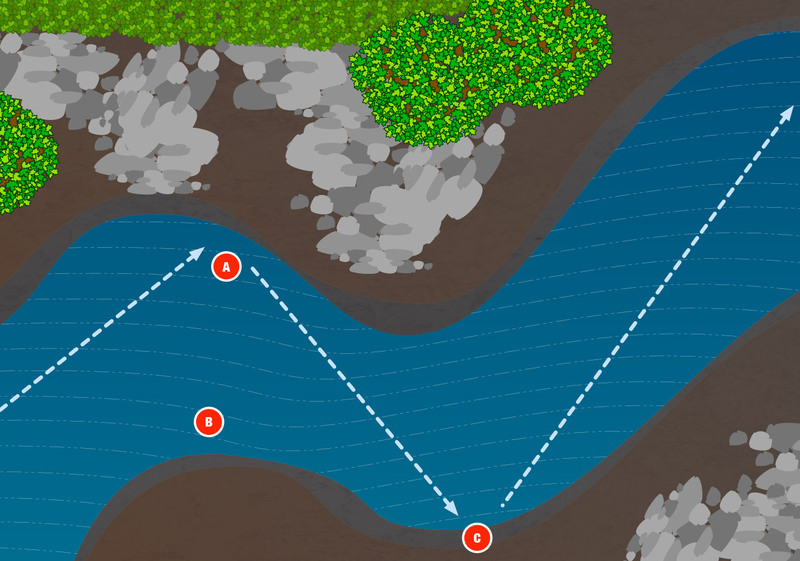 Eddy Line Separates the downstream flow of water from the upstream flow found in an eddy behind an obstruction. Holes Holes, are so-called because their foamy, aerated water provides less buoyancy and can feel like an actual hole in the river surface. Hydraulic Where water drops over a obstruction (rock ledge or a rock) into deeper water on the downstream side. 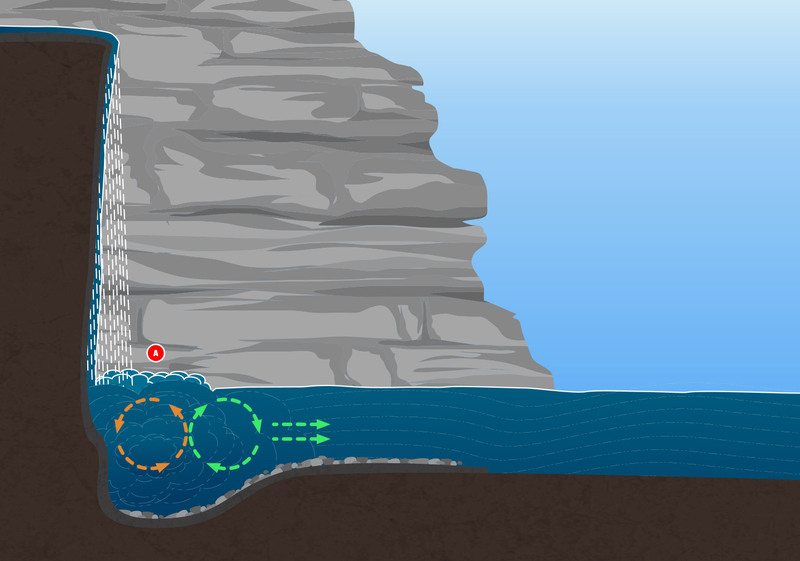 This causes water on the surface to be drawn back toward the rock or ledge. Strainer Usually where water passes through log or other items. The orientation of the canyon is determined relative to the flow of the water, not the viewer’s perspective. The sides of a canyon are named either Canyon Left or Canyon Right. You also have both Upstream and Downstream. There will be sometimes an exception to this rule where the river can flow in reverse depending on tidal flow. These types of exceptions are usually only found in canyons connected to oceans. U Upstream – The direction from which water is flowing from. D Downstream – The direction in which (or to which) water is flowing. CL Canyon Left – The left side of the channel when looking downstream. CR Canyon Right – The right side of the channel when looking downstream. Note: It’s always important thing to remember is that “canyon left” and “canyon right” are always from the direction of flow. 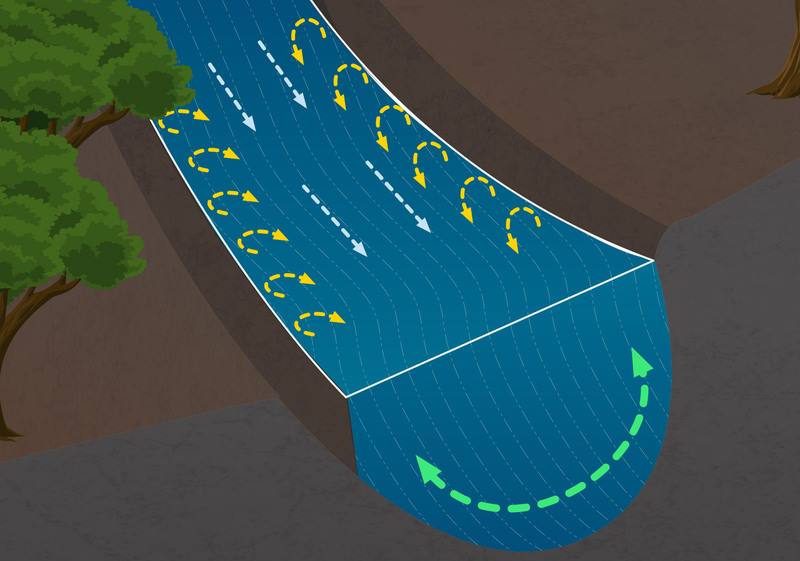 There are two types of cunent flows encountered in moving water channels. When floating in the canyon channel, the water does not all travel at the same speed. Layers of water in contact with the channel bed and sides are slowed by the effects of friction. In addition, the water a little closer to the middle is slowed by friction against the slower water beside it. The quickest flow is in the center of the channel just below the surface – furthest from the bottom and edge of the canyon walls or bank. This is a spiralling effect caused by the bank slowing the water at the edge of the river and the faster movement of mid-channel water. It is a relatively unusual feature in natural rivers but can be found in a canyoning environment due to the rock walls. Helical flow pushes a person away from the bank and into the center of the flow. Moving water flows in a straight line until it hits an obstacle. 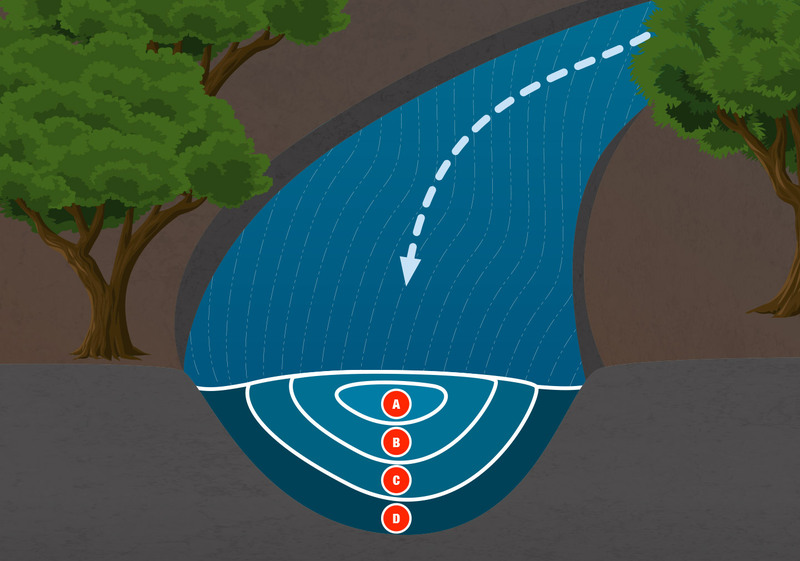 The technical term for the direction the water is “current vector.” Water does not curve around bends in a river or channel, rather it “pin balls” or ricochets from obstacle to obstacle. As a result, the current creates high pressure areas where it impacts the outside of bends. This can cause erosion, leading to undercut banks. Conversely, there will be low pressure areas (and slower water) on the inside of bends. This can lead to deposition (i.e. build up of sand, gravel or debris) and shallow water on the inside of bends. 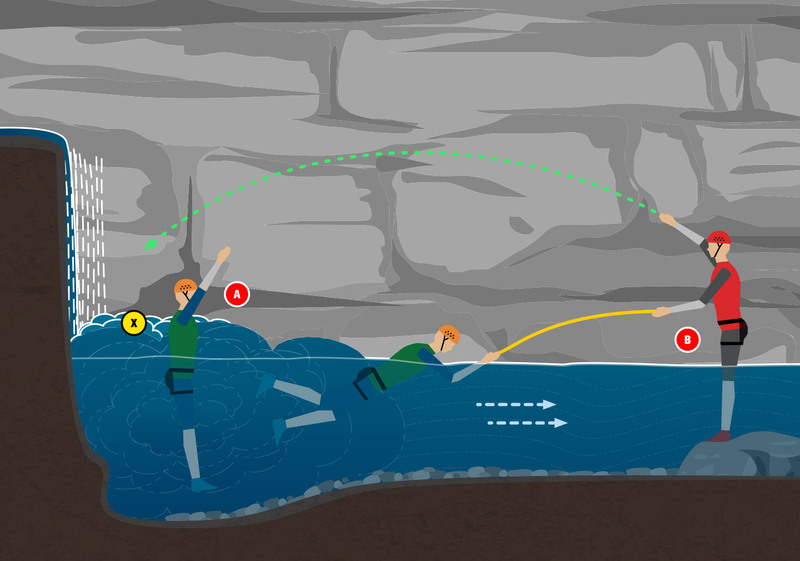 An awareness and understanding of current vector is essential to allow yourself to be able to successfully traverse the canyoning environment and perform rescues. There are many scenarios in white water canyons that require special techniques to navigate and descend in a safe manner. As a reminder, no two canyons are the same but there will be certain elements and scenarios that are fairly common to all canyons. Also not all scenarios presented here exist in all canyons, but you still need to understand and be informed of the inherent risks. 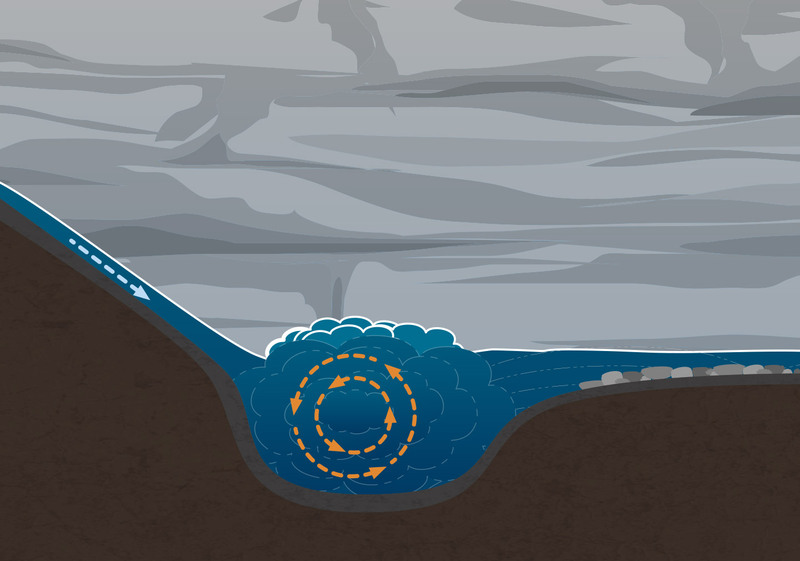 Probably the single most important feature to learn in swift water and for water hazards are eddies. Eddies are formed on the downstream face of an obstruction. Eddies swirl on the horizontal surface of the water. Typically, they are calm spots where the downward movement of water is partially or fully arrested – a nice place to rest or to make one’s way upstream. Understanding and spotting eddies can take time and practice. Eddie swimming is something that should be done practiced consistently. A Float downstream, feet first and keep a look out for an eddy. B When coming to the eddy line, manoeuvre yourself to be on that line. C Roll over in the direction of the eddy and swim up to the calm spot. On fast moving water, swim as fast and hard as possible. Once in the eddy area, you can then relax. In most canyons moving across the river is quite simple and easy but there will be cases where you will have to cross a very fast flowing section of a river. When crossing a river always check upstream to see if there is any dangers coming down the river such such as floating trees or other hazards. It is also advisable to have a throw bag in with you in all water based canyons. Usually the easiest solution is to find a shallow area where the water is not flowing as strong and cross there instead. The crossing could be metres away of where you need to be but could be one of the safest options around. Crossing a river is a group is a common practice used in swifter training. There are several methods that can be used depending on the situation but the two most common methods is either using a pyramid formation or single line. 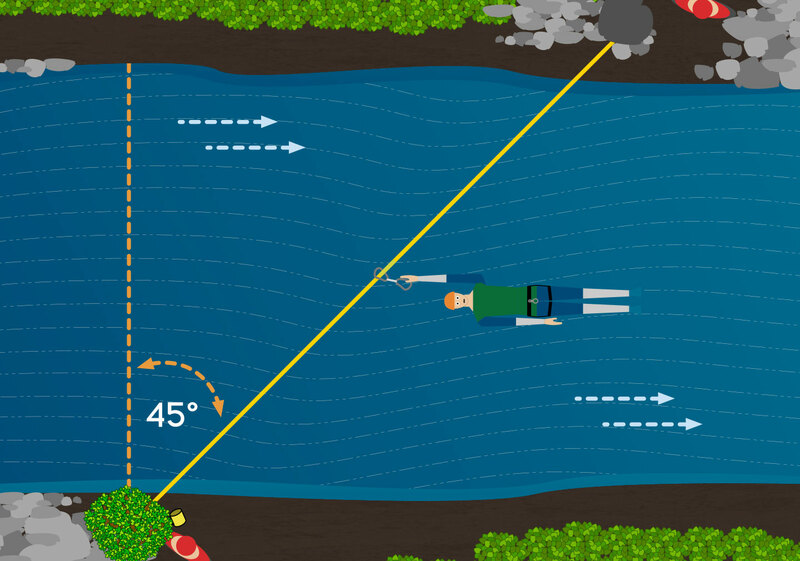 Setting a tensioned diagonal line should be used in deep fast moving swift water. To setup have one of the strongest swimmer go first with a rope attach to the harness using a 2nd chance munter mule (Never directly attach to the swimmer). If the flow of the water is too strong you either pull the swimmer out or they can release themselves from the rope. 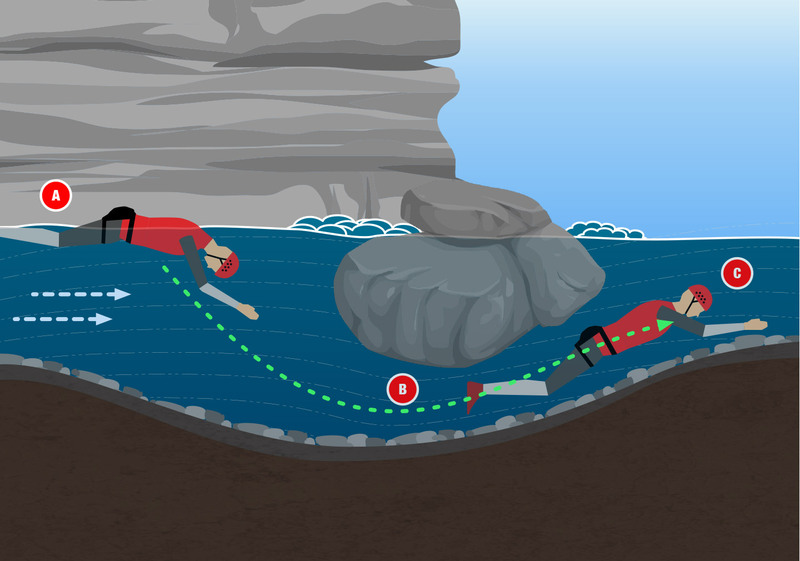 A Dive facing upstream using a safety dive and swim out as far as possible. B Make your way to the opposite side . You may need to scout for eddies. C The remaining party stays at the back managing the rope for the swimmer. Once across set up the rope at a 45 degree angle going downstream. On both sides of the river it is best advised to use a releasable systems instead of a fixed line so the system can be adjusted as needed. You can also use body anchor (meat anchor) as well. An important feature of the tensioned diagonal is to keep it as tight as possible. If you get any sag in the line it can cause a vector angle and the person could get stuck in the middle of the crossing. The remaining people to cross will clip on to the rope using a Quickdraw or two carabiners so that you can hold on to with your hand only. 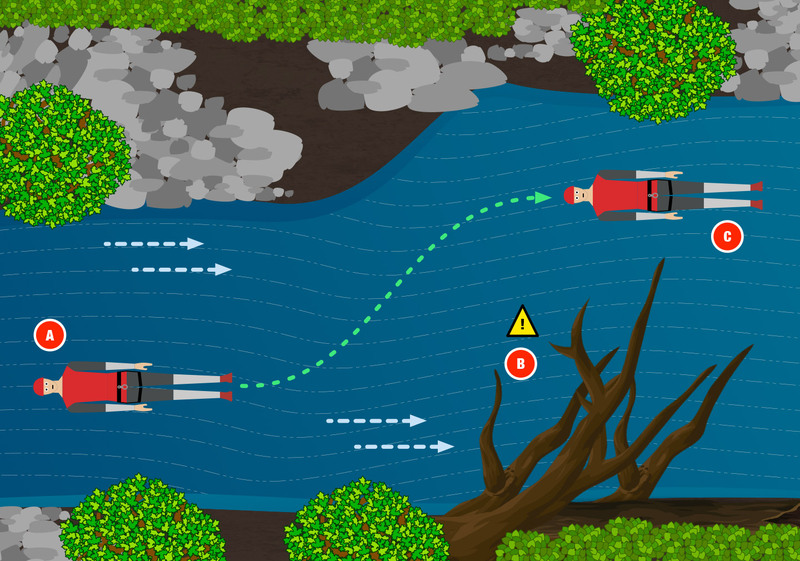 Position yourself downstream of the rope and the current will push them along to the other side following the rope. Try to keep a fairly relaxed body whilst crossing. Note: Do not clip your cowstail/lanyard directly on to the rope. If you get stuck you will not be able to easily release them and swim for safety. 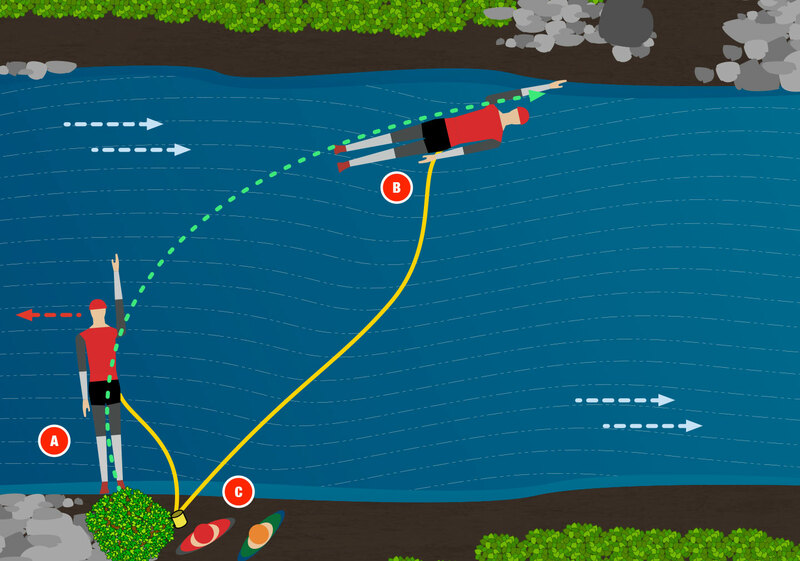 The final person across should attach the rope to their harness using a 2nd chance munter mule and then swim across with the opposite side reeling in the rope or if needed using vector pulls to bring them into the rest of the party. If the current is too extreme or there are people who are not confident swimmers, a Tyrollean Traverse should be used instead. 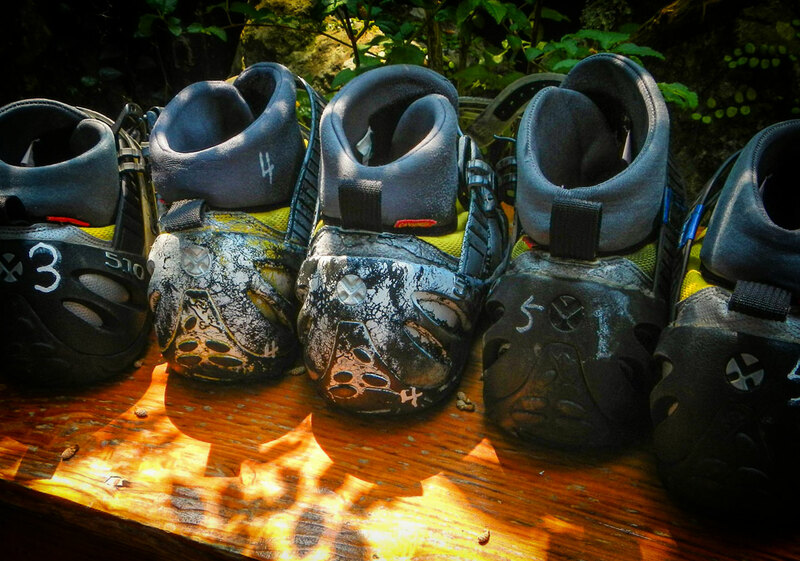 A fairly common occurrence, foot entrapments can happen at anytime and to anyone during a canyoning trip. When walking down the river, good communication is key to notifying the rest of the party of foot entrapments that may exist. Rocks, logs and other obstacles can be waiting there to trap a foot whilst walking along the riverbed or catching a dangling foot while floating. When this happens in moving water, there usually isn’t time to remove the foot. The current can push the person down, often locking their foot in to place. In severe cases where the water is high enough a foot entrapment can force a person under the water therefore drowning them. Escape: Some foot entrapments can be released by swimming down and leveraging the obstruction or removing the shoe. Escape: Typically the only way to release a foot entrapment is by pulling the person out in the reverse direction they went in. Using a throw line or rope have a person on each side of the entrapment, place the rope under the arms and walk back slowly hopefully releasing the entrapped person. Strainers are formed when an object blocks the passage of larger objects but allows the flow of water to continue . These objects can be very dangerous, because the force of the water will pin an object or body against the strainer and then pile up, pushing it down under water. For a person caught in this position, it will be difficult or impossible to get to safety, often leading to a fatal outcome. Strainers are formed by many natural or man-made objects, trees that have fallen into a river (“log jam”), bushes by the side of the river that are flooded during high water, wire fences or other debris. Strainers occur naturally most often on the outside curves of rivers where the current undermines the shore exposing the roots of trees and causing them to fall into the river forming strainers. They are quite common in a lot of canyons and can shift over time as well. They can also be quite unstable as usually in a canyoning environment the strainers are made up of broken trees and branches. If you need to climb up on top of a strainer make sure that you watch for movement of the strainer and be prepared for collapse. The best solution is to try and avoid them altogether. In a river, swimming away from the strainer and into the main channel is recommended to get away from the strainer. Always keep a look out on the strainer while passing as sometimes there maybe a branch or log hidden underneath the water. A Start adjusting your position. B Keep your eyes on the strainer downstream. Be aware that strainer can actually be wider and hidden under water. C Safely navigated past the strainer. 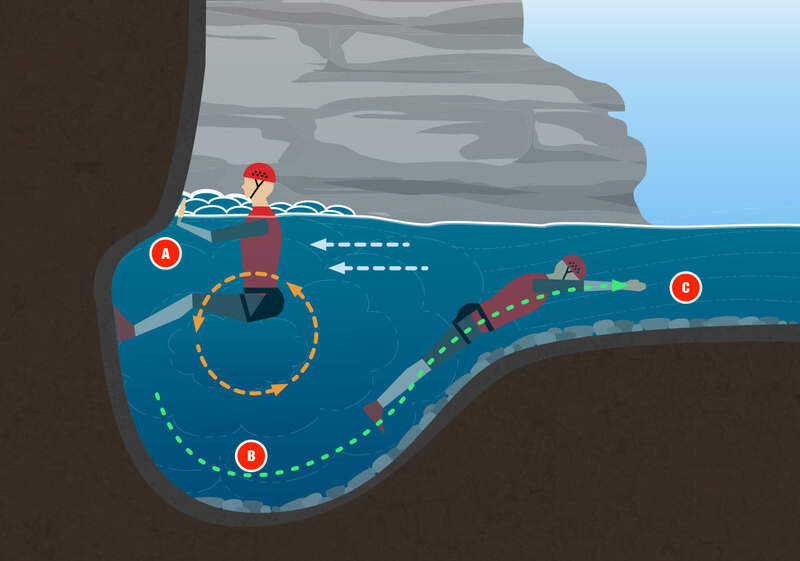 In a walled canyon, If it is impossible to avoid the strainer, one should swim hard towards it and try to get as much of ones body up and over it as possible. Do not attempt to dive under the strainer as this could be then turn into a siphon scenario instead. A Swim as fast as possible towards strainer. B Use the trees to pull your self over the strainer. Be aware that sometimes the strainer can move with added weight. They are dangerous, if the current is strong, since the space for maneuvering is reduced and often have undercuts where it is possible to get caught in. Escape: The Center tend to have an output stream, if the recirculation is not very closed, you can try to pass through the midline. The relationship between the speed of moving water and the force it exerts is not a linear one. Instead, the force increases by the square of the speed. For example, if the speed of the water doubles, the force that the water exerts on an object is quadrupled. Rounded figures are based upon research carried out by the Ohio Department of Natural Resources in 1980. These approximations will vary depending upon the height and weight of the individuals, their clothing, the composition of the channel bed, etc. Undercut rocks occur along rock walls and anywhere there is a consistent water pressure hitting against a the canyon wall. The rock structure underneath the water wears away, leaving the higher layers untouched. When water hits these undercuts they tend to circulate the water in a circular direction. The shape of undercut change this movements and are usually perpendicular to the direction of the current. Undercuts can be characterised by the output of small bubbles which have a distinctive bluish colour. If the flow is has increased then a large boil will be next to the wall. Extreme care must be taken to anticipate an undercut. The best technique to avoid being stuck in an undercut will be observation along with readiness. Position yourself feet-first (same as in water force) with your legs stretched to hit on the wall. Use the flow of the water to try to swim along the rock moving downstream until you are clear of the rock. When your feet drops below the waterline where the current is strong, they will catch more easily. As undercuts usually form on the outside of the curve, you have to move to the outermost edge, where the current is less. Undercuts can be classified into two types, Open and Closed. 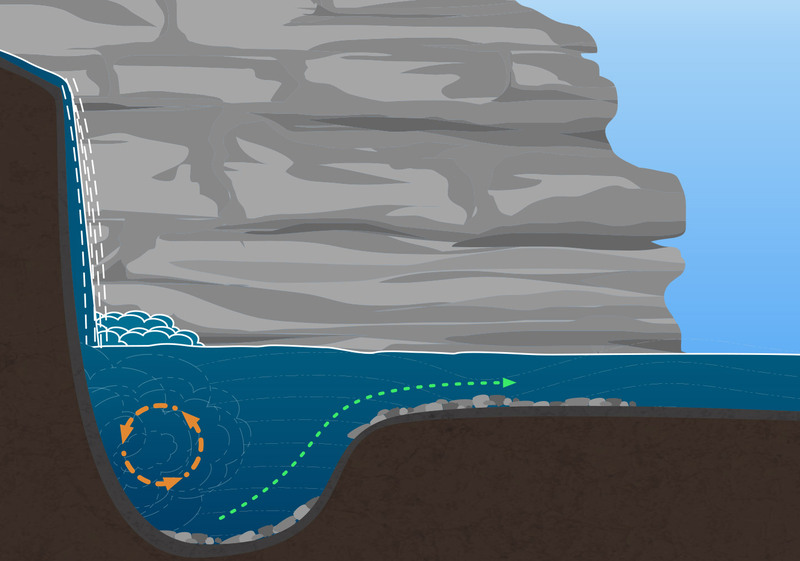 Open undercuts that the shape of the rock (type cave without any overhang on top), creates a current that enters through the top of the hollow rock, and low following his appearance, until the current sale. Open, because water as it enters, leaves. When the water force is very strong they can be very hard to escape as it can be difficult to detach ourselves from the wall. The output current is at the bottom. Closed undercuts, at the top of drilled rock, have a protrusion facing toward the bottom. This protrusion is the culprit that is believed a power locked inside the rock. This undercut is called closed because anything that absorbs will be trapped inside. The two options are more complicated to find trunks, branches, or other objects stuck inside. She is clear that the undercut is a movement of water to avoid always. 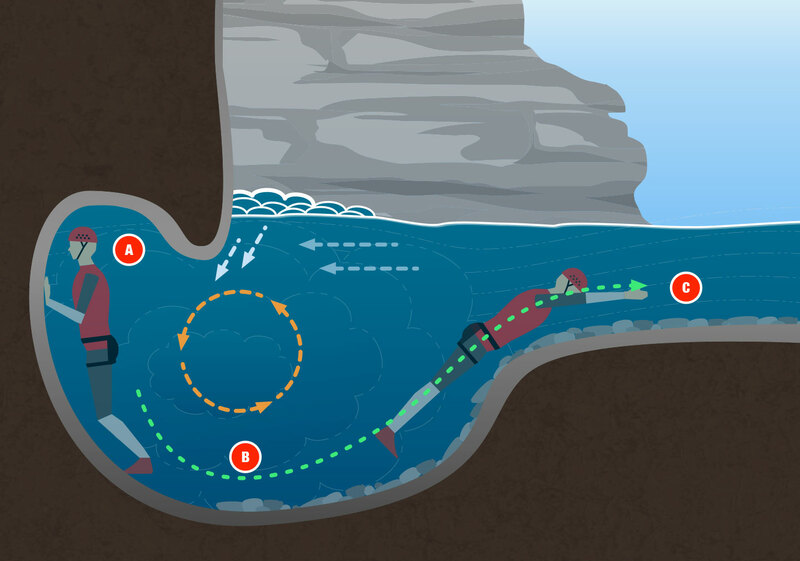 Siphons are possibly one of the most dangerous water hazards that we can find in a canyon environment, due to the fact we can never know from from just looking at it if they are a narrow passage or a dead-end. They also form when water passes underneath a submerged part of an obstacle. This could most likely will be submerged stones or bolders or clogged by branches, logs, etc. Sometimes they can be identified because the output you can see air bubbles but that does not guarantee that there is a path through or not. It is important to note that the siphon may not always be visible, as sometimes they are fully submerged. Siphons come in all sizes and shapes. Large siphons have a possibility to be able to swam through and comet the other side. Even so, this must be done with extreme caution as they could be blocked at any time. Narrow siphons are one of the most dangerous siphons to come across as they funnel the water increasing speed making it impossible to fight against the flow and force of the water. Narrow siphons tend to be turbulent at the entrance and exit due to the water flow. Swimming through a siphon can only be done if it is clear all the way though but still presents a significant risk. It is always important to be swimming in the safety position with and not with your legs hanging in water as the feet could be sucked into a siphon. If for any reason you or any one of your team are sucked into a siphon, the possibilities of rescue are relatively small. Possible rescue scenarios are to use a rope and let it sink to the person so hopefully they can grasp it and pull themselves out. You can also attempt to enter into the siphon with a rope attached to the rescuer but this manoeuvre is extremely dangerous, resulting in the possibility of both the victim and rescuer being being stuck. 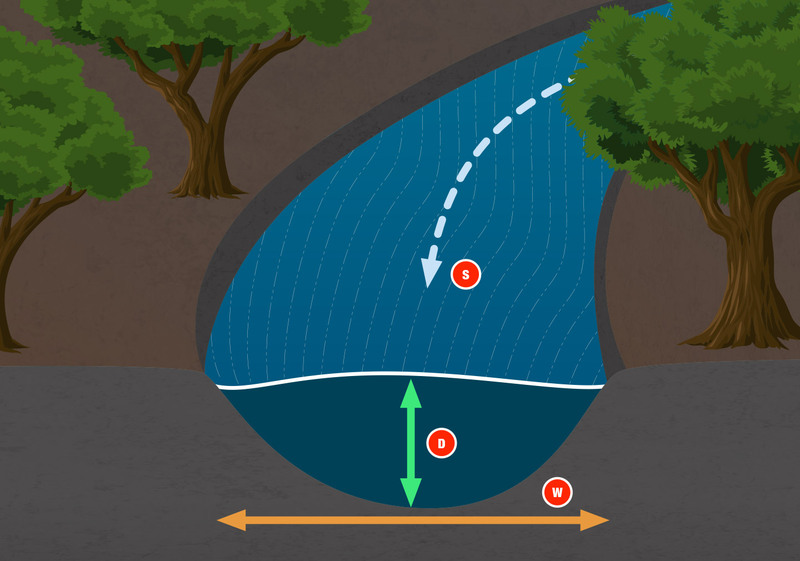 The Washing Machine is a unique feature produced when the water creates a circular motion that excavates the wall so there is a cavity usually under along the course or next to a waterfall. Usually the washing machine is not dangerous but there is a high possibility of being stuck unable to escape. Washing Machines are easily identified as there will be a boil coming out of the bottom, produced by the movement centrifugal water. There are 2 methods of escape that are possible when stuck in this feature. Escape: Allow yourself to go around without resisting the flow and when you come to the exit flow of the Washing Machine swim hard to the exit flow. Escape: If you have to rescue someone who can not swim out you will need to approach the person by either a throw bag or by being secured by a rope and grabbing the stuck person. The Mushroom feature is a hazard that doesn’t present much danger expect in high flow situations where it could pull you back into the flow. Mushroom features occur when water is dropped from height into a deep pool and causes the water to expand in all directions in a radial fashion. The best way to perceive this is as an inverted mushroom. You must be careful in the central area since there is a return current. Although it usually does not pose much problem, because it’s not very big, it can sometimes get you stuck until you can dive deep down to get your self out. Escape: It is best to deviate the rappel to reach one end of mushroom　where the power is a lot less and avoiding to enter central ciruclation. Hydraulics are one of the greatest dangers which we find in canyons and are the main cause of deaths and generally where mistakes and under estimation of the flow usually comes in to play. There are many different types of hydraulics and they vary depending on the depth, flow and the angle of the waterfall. 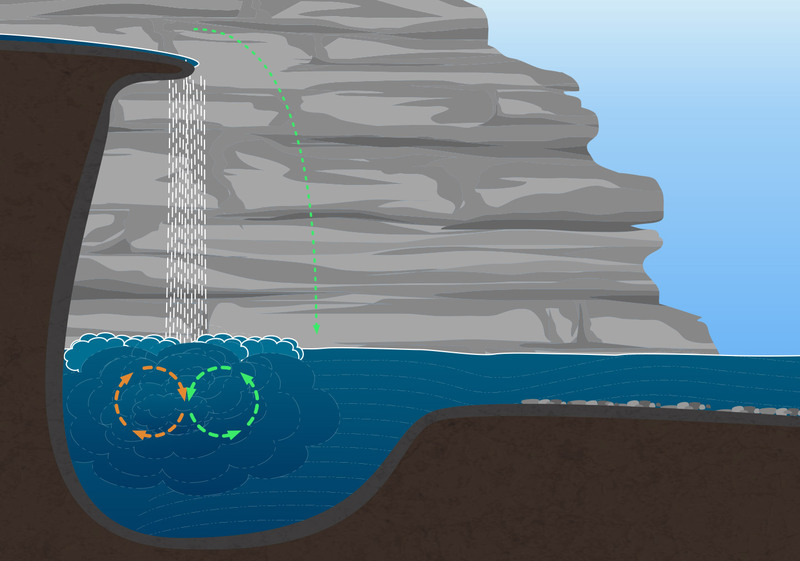 Hydraulics can get produced by a simple pour over of a rock, or by a waterfall or even drop in the runway, etc. The flow of water in a hydraulic is crosses runway either in a forward or reverse circular motion. The reverse circular motion pushes a body back down and back towards the surface which prevents us from moving forward away from the hydraulic. As it is constantly moving it presents a significant danger and keep a body trapped and submerged. The water in a hydraulic is highly aerated and can be very soft due to the amount of air being mixed in. With highly aerated hydraulics, the buoyancy is a lot less allowing us to be trapped and unable to swim out easily. Before entering a unknown hydraulic, it always best to throw in a small stick or branch of tree to watch the behaviour of the stick to understand what type of movement the water we will do. Doing this will help you make an easier judgement on what technique you will use to get through the hydraulic. 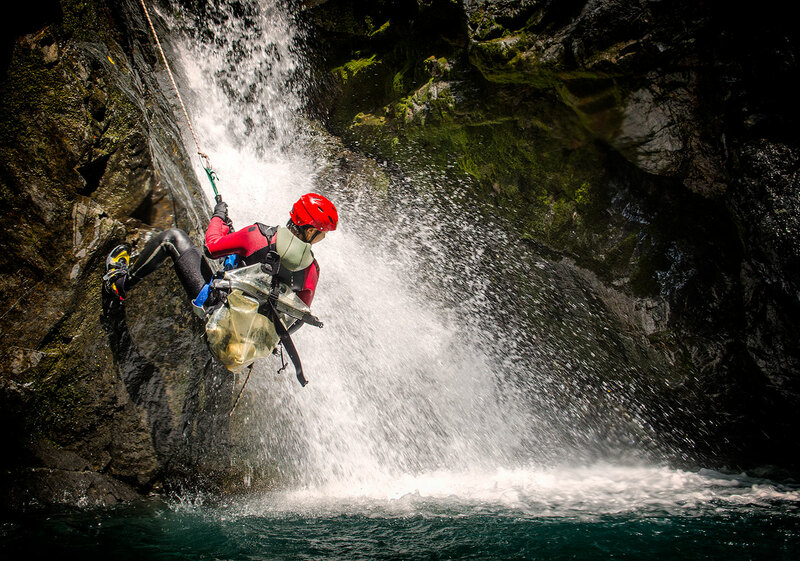 The several main types of hydraulics that we find in a canyoning environment. It is important to understand and learn about each type and the various methods of escaping or creating a diversion to bypass and get around the danger. Two opposing circular currents, one pushes towards the output of the hydraulic and the other pushes towards the hydraulic. This type of hydraulic happens when there is a gap between the waterfall and the back wall of the waterfall. 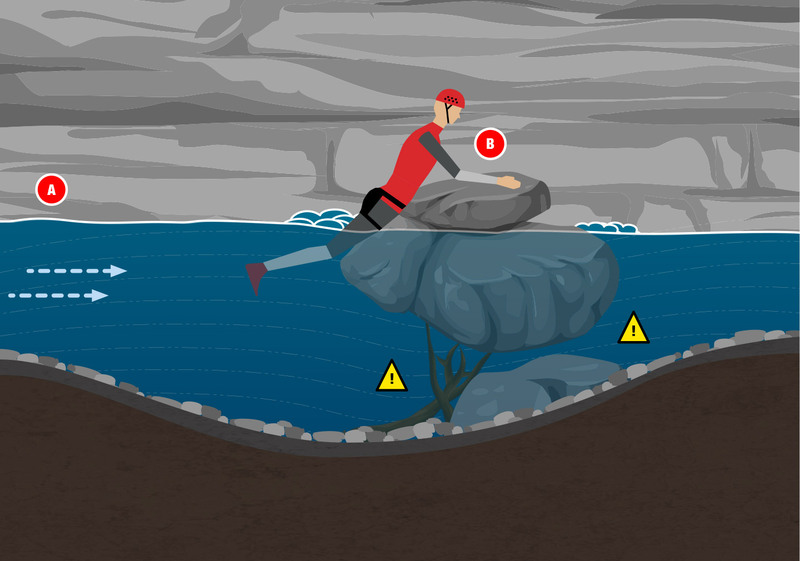 Escape: Dive to the very bottom of the hydraulic pool and take the deepest current which will then lead to the escape flow. A Symmetrical Hydraulic can be identified as it will usually produce very aerated boil where the hydraulic is and there will be some space between the boil and the end the flow. 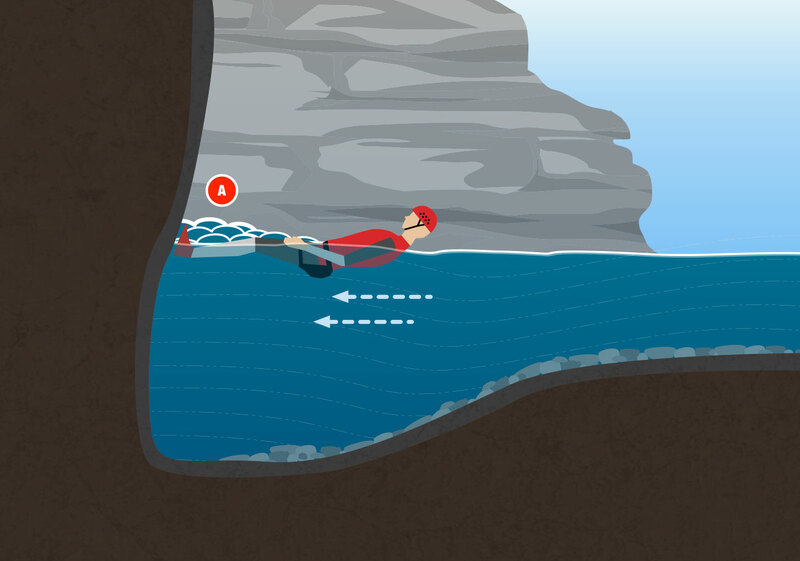 Escape: Dive to the very bottom of the hydraulic pool towards the waterfall and take the deep current which will then lead to the escape flow. An Asymmetrical Hydraulic occurs when the waterfall is completely vertical and the pool is very deep. Similar to a Symmetrical Hydraulic but there is an area without any flow between the end of the boil and the waterfall. Escape: Same as a Symmetrical Hydraulic. 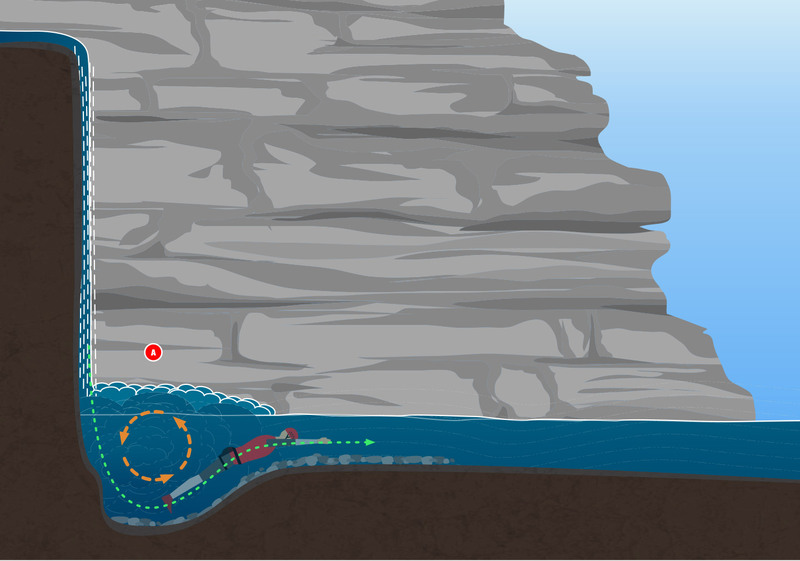 Dive to the very bottom of the hydraulic pool towards the waterfall and take the deep current which will then lead to the escape flow. An Inclined Hydraulic is generated when a low angled waterfall has a strong current and the pool is not very deep. These can be very dangerous as they are connected with the waterfall and its pushes back onto itself with some strength. Note that the Inclined Hydraulic usually traps objects such as logs, branches etc which can make them more dangerous than what appears. Escape: There is no real escape from this type of hydraulic and they should be bypassed and avoided with a guided rappel or handrail. Note: Low head dams are insidiously dangerous because their danger cannot be easily recognised and should be bypassed at all costs. When a fellow canyoner gets caught in a hydraulic and cannot leave on their own accord there are a couple of possible alternatives that can help rescue them. Throw and emergency rope (kayak rope) at the time that person appears on the surface. 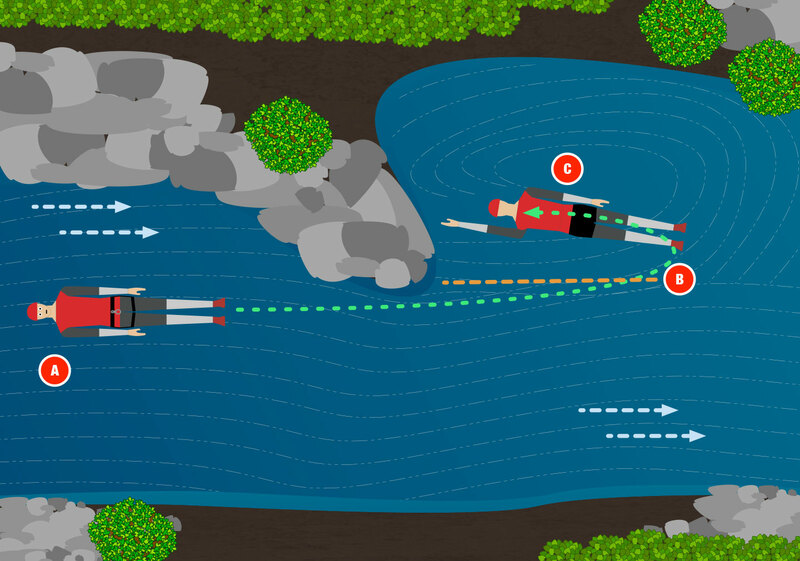 To do this you must be placed downstream and in a place where you can easily pull the person out. A second method is to attach yourself to a rope and enter the flow to reach the person in trouble. After grabbing the person in trouble the other team members pull us out with the flow. There are several ways to avoid falling into a dangerous hydraulic but the The simplest way is to bypass the feature completely by either walking around or down climbing a section away from any danger. Jumping over a hydraulic is probably the most common method provided that we know that the jump is possible and that you can make it to the output flow. Jumping is always a very dangerous move to do even though the canyon has been done before as there is often that chance of having branches, trees or scree changing the depth of the pool. (see Sliding & Jumping Section for more Information). A Floating Anchor is an advanced technique similar to a guided rappel. There are a couple of different methods of making a Floating Anchor providing that the force and flow of the water will allow us to use it. 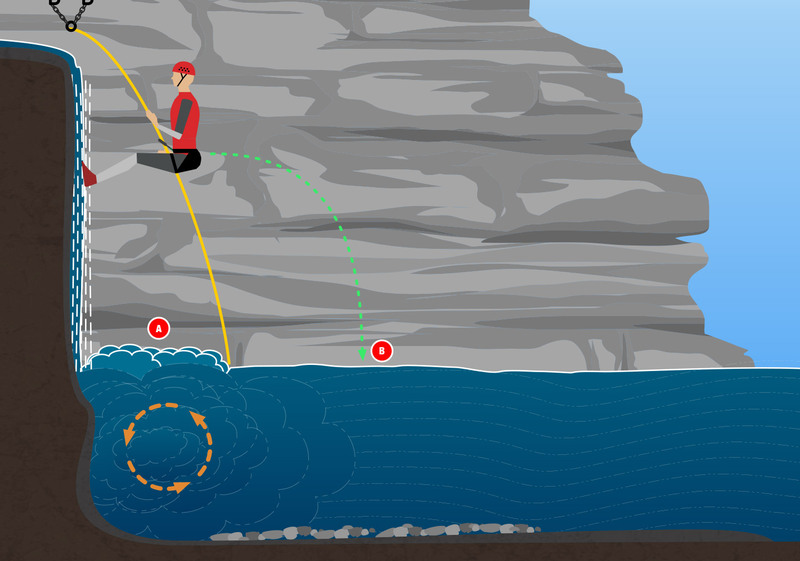 When using a Floating Anchor it is important to travel along the rappel line as quickly as possible by not introducing a vector and pulling the anchor away from the waterfall lip. To make a floating anchor, attach a rope to the either to the top handle of a rope bag / back pack with the mouth of the bag open. Throw the bag to the waterfall lip, or let the bag be dragged to he waterfall lip. Once at the lip, allow the bag to be constantly be filled with the water from the waterfall. 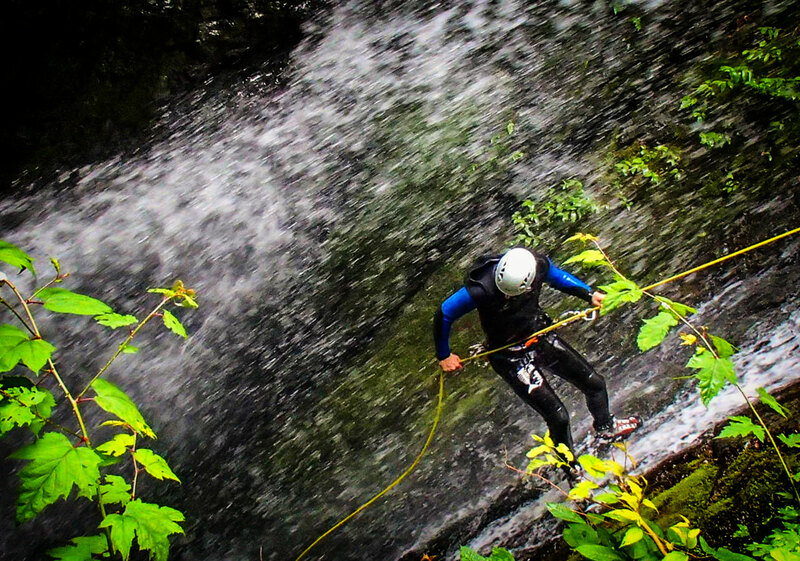 It is important to allow approximately 1 metre of extra length over the waterfall lip before tying off the rappel line. This extra length will help compensate when someone is on the rappel line. The second method is to use a double floating anchor. 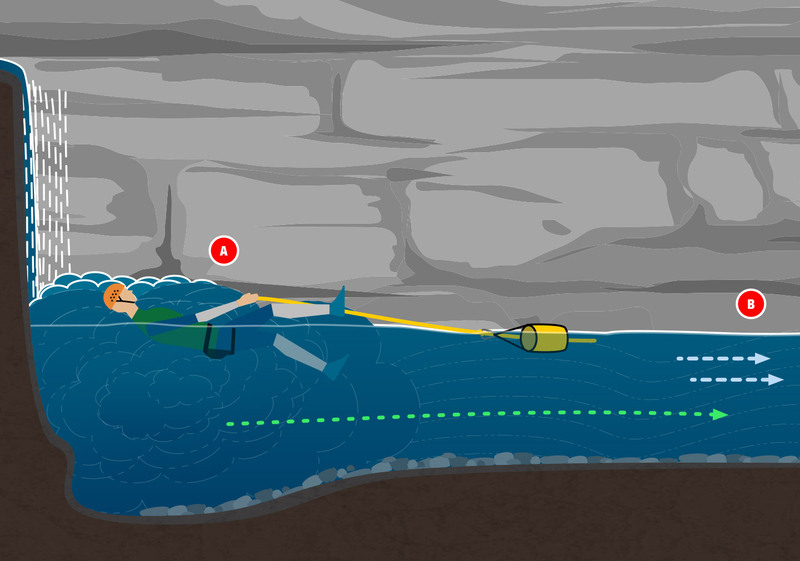 A double floating anchor involves using a smaller bag to throw over the waterfall lip to help drag a larger bag that will be used for the anchor. This technique is quite useful when you have a wide distance to play with and the larger bag cannot be thrown efficiently. The same principle applies as a standard Floating Anchor. A Tow Anchor is a helpful tool to help you out of a hazard by floating a bag down the flow to help pull you out. The best way to do this is to attach a bag to your harness using a Munter Mule. Do not directly tie into the rope using a Clove Hitch or Figure 8. In case there is problems you can release the Munter Mule and launch the rope bag into the flow which can then help pull you out. An Rappel Jump is a technique that where you will have to take all the same precautions as a normal jump, but with the added risk of rappeling to a point where you can effectively push off the end of the rope. 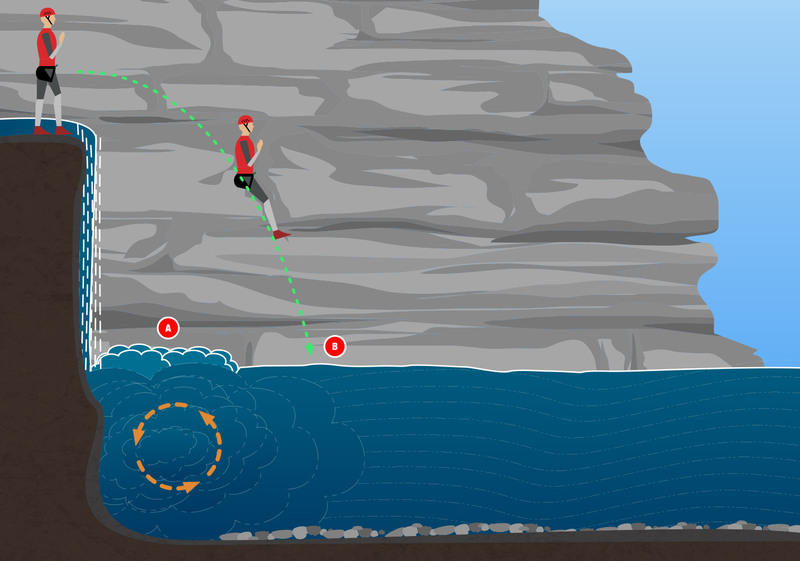 When setting an Rappel Jump, the rope must be at least half the distance off the water versus the length of the hydraulic. 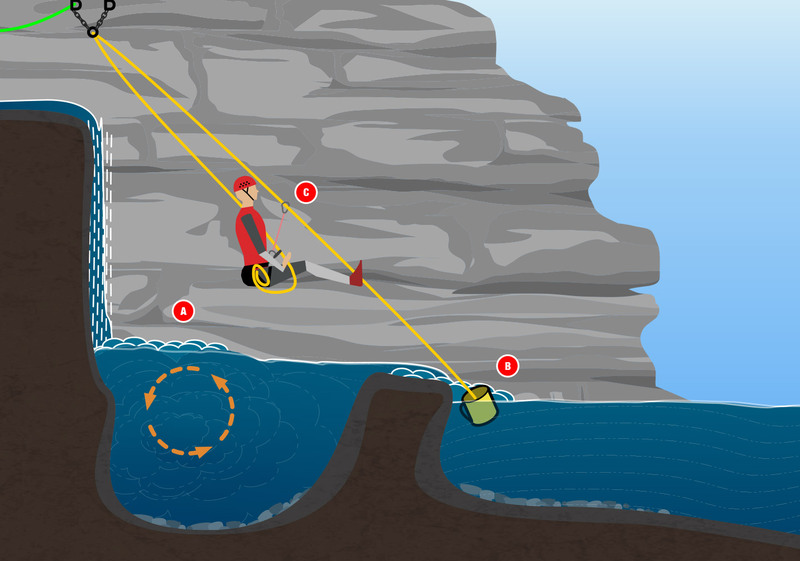 When arriving at the end of the rope, you must be able to push off the wall to propel yourself over the hydraulic or hazard. Canñones. Manual de hidrología para barranquistas. © 2013 - 2019 Canyon Magazine and the respective authors. Canyon Magazine is run from our own pockets. Help us stay online by clicking the donate button below and supporting us. We always love to hear what you think about Canyon Magazine. If you have any comments, suggestions or any other ideas, please fill out the contact form below and we'll get back to you as soon as possible.